Please refer to our stock # 3235 when inquiring. Casas Grandes Pottery Polychrome Animal Effigy Bowl, ca. 1150 - 1250 CE. 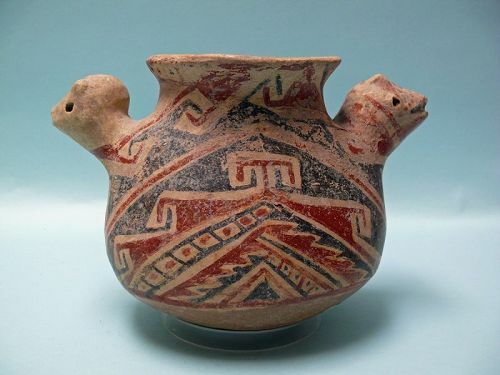 With two animal heads as handles. Buff, brown, and black pigment. Some wear due to age and use. In very good condition. 7" x 10 1/2" x 6". Ex: Christie's New York. Casas Grandes (Spanish for Great Houses; also known as Paquimé) is a prehistoric archaeological site in the northern Mexican state of Chihuahua. Casas Grandes is one of the largest and most complex Mogollon culture sites in the region. Settlement began after 1130 CE, and would see the larger buildings developed into multi-storied dwellings after 1350 CE. The community was abandoned approximately 1450 CE. Casas Grandes is regarded as one of the most significant Mogollon archaeological zones in the northwestern Mexico region,linking it to other sites in Arizona and New Mexico in the United States, and exhibiting the expanse of the Mogollon sphere of influence.